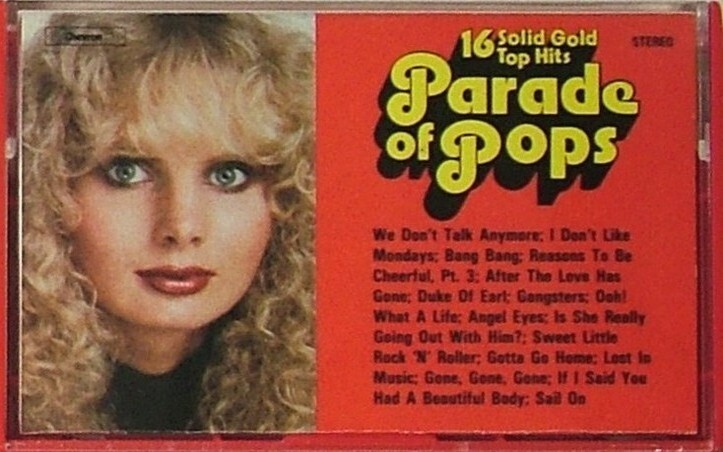 After some years of decline, resulting in a period when only "Top of the Pops" was in production, the covers album underwent something of a revival in the late-1970s, thanks largely to the popularity of the cassette format, and to the Chevron label in particular. Chevron was set up in 1977 and was owned by and sold exclusively through Woolworth’s. 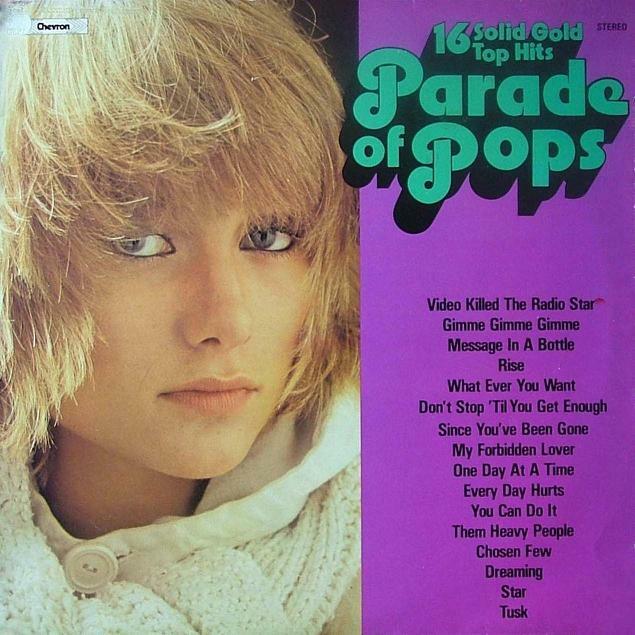 Thus, it is a successor to Stereo Gold Award, but where the Parade of Pops series is concerned, links with the Windmill label are more evident. 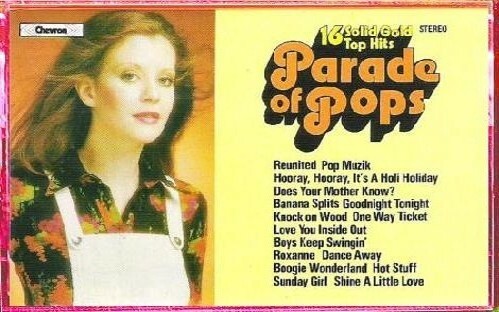 Chevron re-released a high number of Windmill's old albums, usually on their preferred cassette format, and also undertook a re-launch of the "Parade of Pops" series, along with end-of-year collections named "Top Hits of the Year". 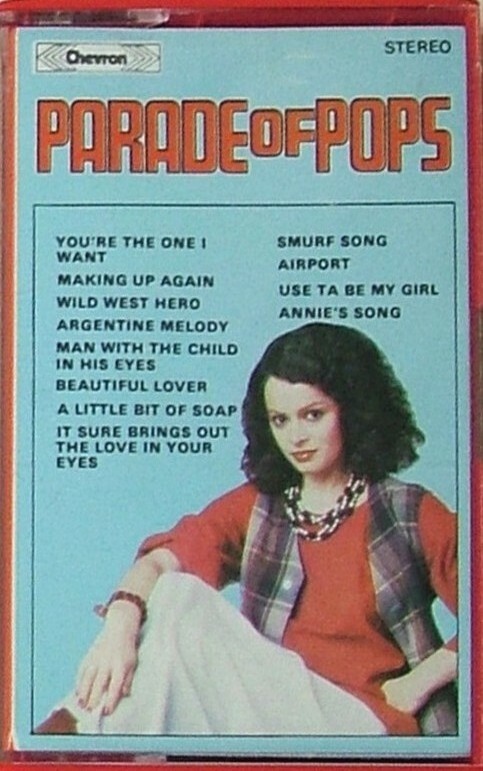 "Parade of Pops" ran to seven volumes on cassette only, before the LP came into play. (Some of the ensuing LPs were issued on coloured vinyl.) With volume 19, it was back to cassettes only. The recordings on these albums were sourced from Coombe Music, with the records distributed through Multiple Sound Distributors, under managing director Ian Miles. Coombe Music leased the same and other recordings to various little-known labels for ad-hoc albums throughout the period, and significantly, from CHVP 6 onwards, these tracks formed the basis of the late editions of “Top of the Pops”, the longest running covers series ever and Chevron’s only major competitor in the late 1970s/early 1980s. Note: These releases do not have official volume numbers. Using the catalogue numbers as equivalents is awkward, since CHVP 13 was missed out of the sequence - presumably for superstitious reasons - leaving the volume numbers out of synch thereafter. Catalogue numbers given below are for the cassette editions. Numbers for the LPs, where extant, match the cassettes but with the letter L added to the end of the letter prefix (for example, CHVP 17 becomes CHVPL 17). 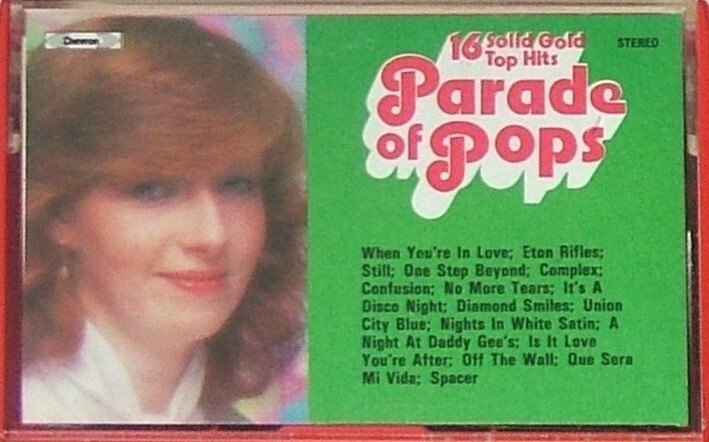 Comments: Despite the front cover, the album title is given on the spine and cassette shell as "Parade of the Pops". 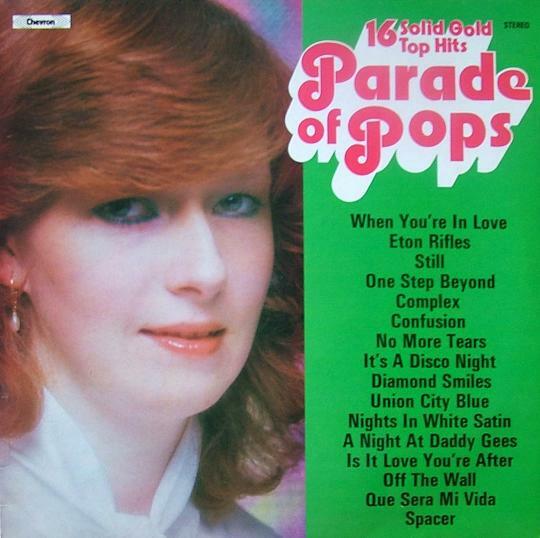 Comments: From here on, recordings on these albums will also appear on the Top of the Pops albums. 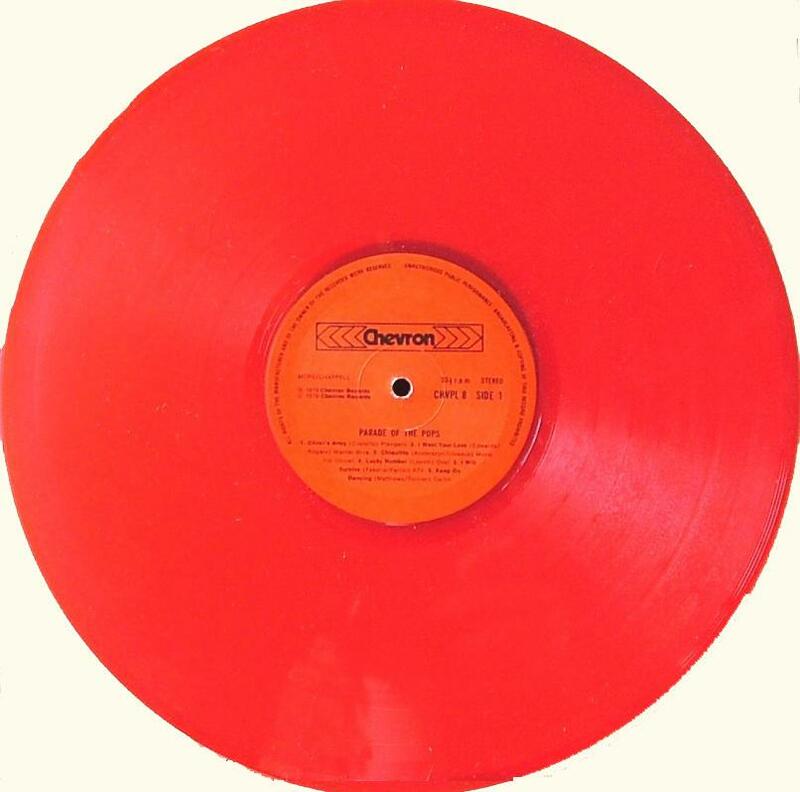 Comments: LP was pressed on red vinyl. 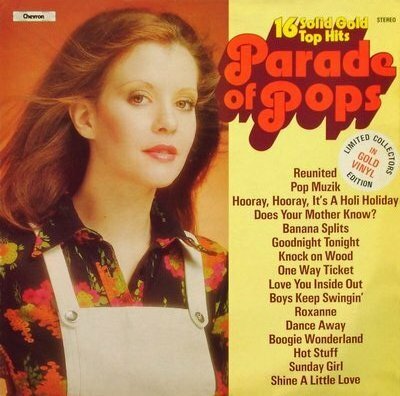 Label gives album title as "Parade of the Pops". Comments: Has a “retro” sleeve based on the Windmill design. Model is Beverley Pilkington. Comments: Album is the first to expand from 12 to 16 tracks, which would become standard from here on. 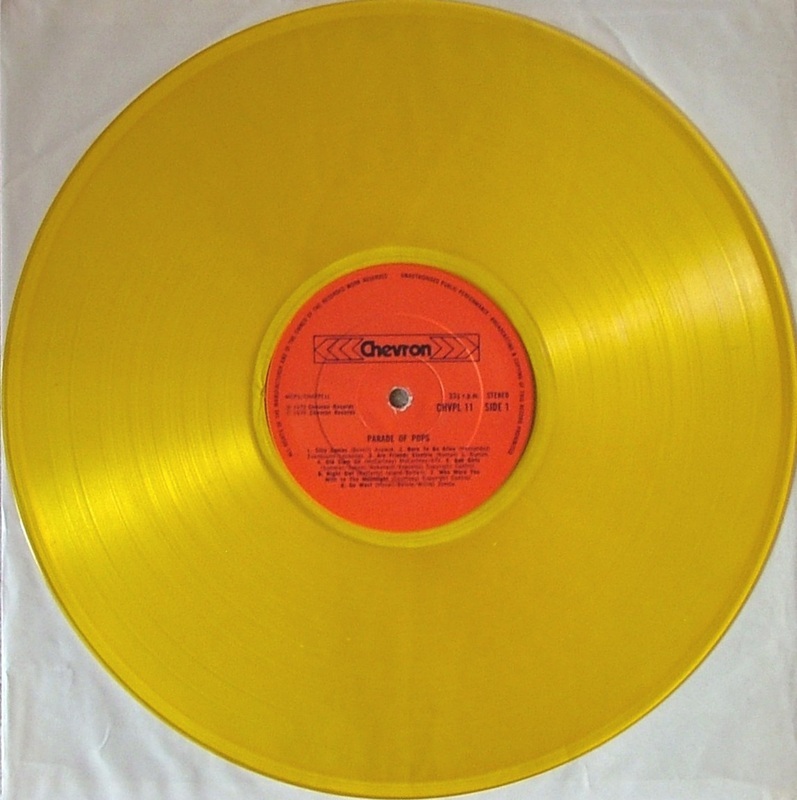 LP pressed on translucent “gold” (in fact yellow-orange) vinyl. 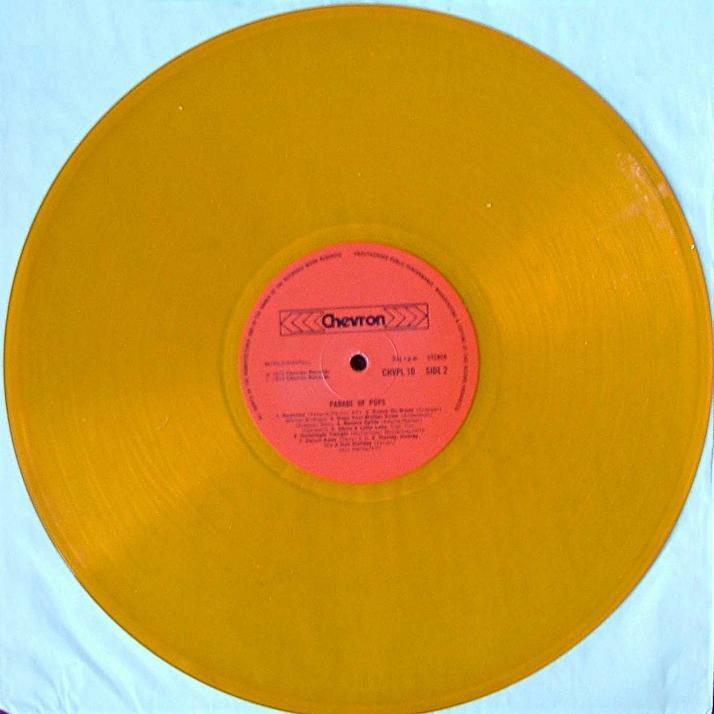 Comments: LP pressed on translucent “gold” (in fact yellow-orange) vinyl. 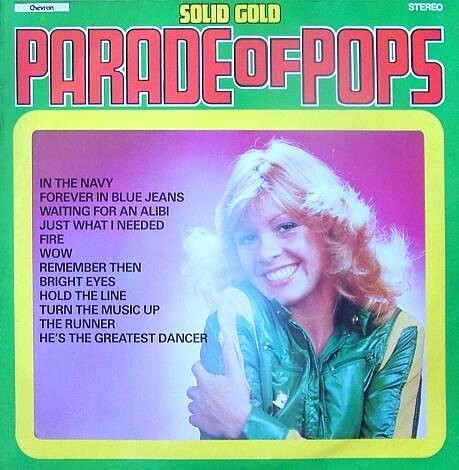 Comments: LP pressed on translucent “gold” (in fact yellow-orange) vinyl. Cover model is Carolyn Evans. Comments: Came with a free flexidisc promoting an unrelated record. NB: There is no CHVP 13 in the discography. Cassette edition has a very slightly different photo to the LP cover. Comments: Cassette edition has a very slightly different photo to the LP cover. 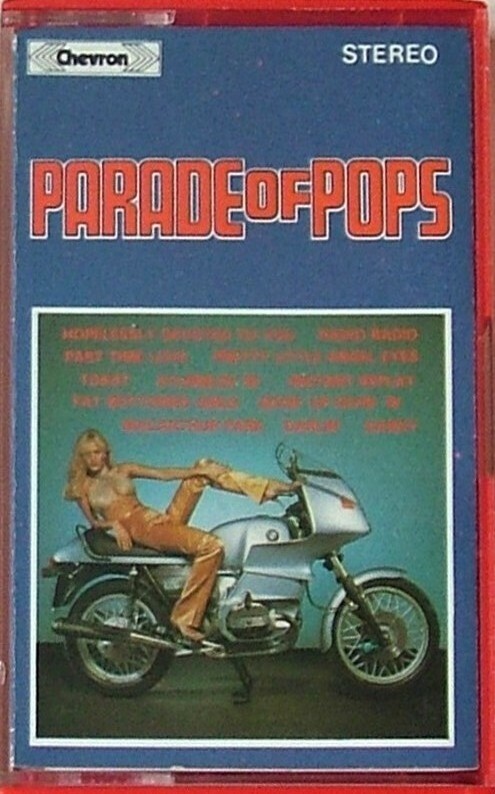 Comments: Cassette edition reverses the photo on the LP cover. Comments: Cover model is Sian Adey Jones. Cassette edition reverses the photo on the LP cover. Don't Stand So Close To Me / One Day I'll Fly Away / The Sunshine Of Your Smile / Another One Bites The Dust / Baggy Trousers / Three Little Birds / Misunderstanding / Dreamin' / Feels Like I'm In Love / Ashes To Ashes / Start / Masterblaster (Jammin') / Can't Stop The Music / Searching / A Walk In The Park / D.I.S.C.O. Comments: Act credited as The Sound Sensations. 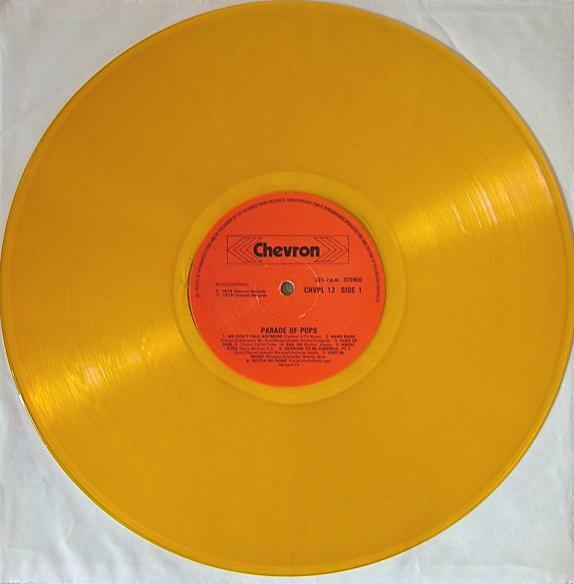 CHEVRON RESUMED IN 1984 WITH THE SERIES, "THIS IS MUSIC". SEE SEPARATE PAGE. Comments: Released on cassette and LP. 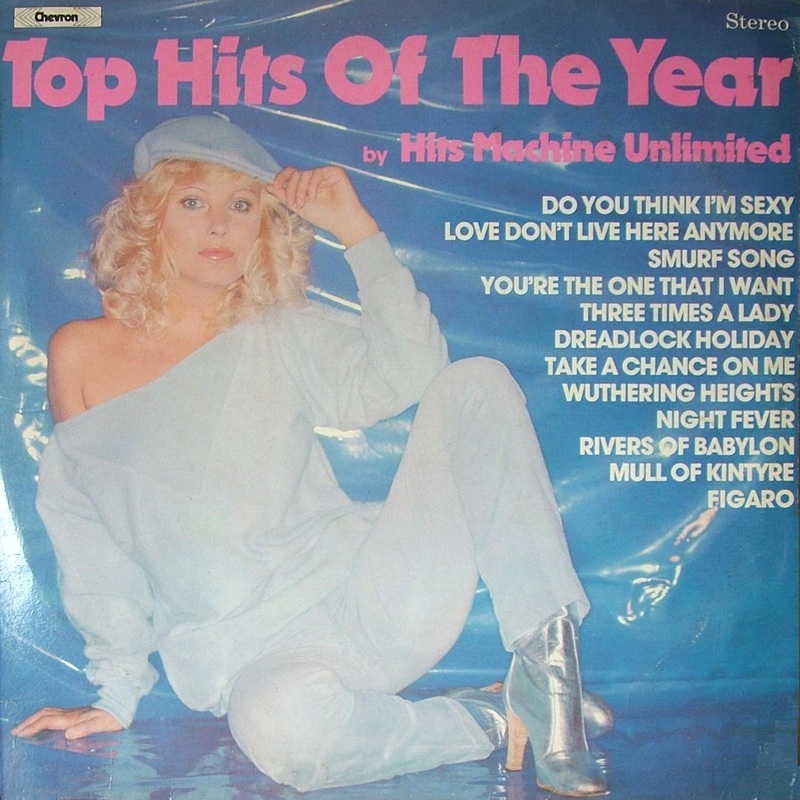 Act credited as Hit Machine Unlimited. Contains six “new” tracks not sourced from the main series. The cassette is known in two editions - one a white cassette shell with black print, the other a black shell with white labels stuck on. Comments: Released on cassette and LP. All tracks from the main series. Comments: Released on cassette only. Act credited as LA Sounds. Contains four “new” tracks not sourced from the main series. Comments: Released on cassette only. Act credited as Sound Sensation. Contains two “new” tracks not sourced from the main series. Comments: Only four tracks are from main series, which folded in the spring of 1982. Act credited as Sound Sensations. Comments: Act credited as Sound Sensation. None of these tracks were featured on Chevron albums previously, since the label had none in production through 1983.